Hundreds of Cuban medical professionals traveled to the African region to help fight the deadly virus. 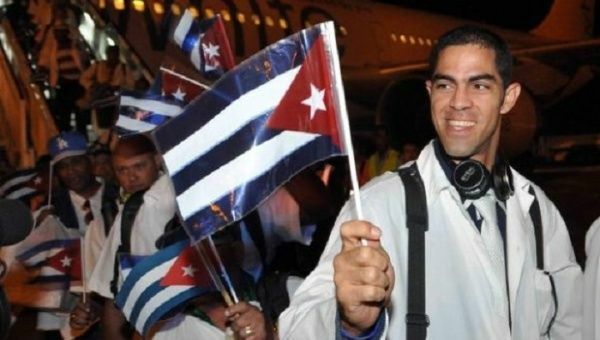 A group of Cuban medical professionals who had been providing front-line medical attention in countries affected by the Ebola epidemic returned to Cuba Monday after a six-month stint in West Africa. The Cuban team was sent off to a chorus of praise for their work in fighting the deadly virus. “The Cuban doctors were not concerned with the risk they ran, they said they were brothers from the other side of the ocean and that they had come to help us as brothers,” Liberian Foreign Minister Augustine Kpehe Ngafuan told Cuba Debate. “This is yet another example of what I already knew about the work of Cuban doctors in other parts of the world: high commitment, good practice, and of course, respect for the human rights of the sick,” said Mauricio Calderon, the vice-coordinator of foreign medical teams for the World Health Organization in Sierra Leone. Hundreds of Cuban medical professionals arrived in West Africa in October after the secretary-general of the United Nations made an appeal for assistance to help treat and contain an outbreak of the deadly Ebola virus. The virus has not been eradicated but the rates of infection have dropped considerably. The outbreak has resulted in 8,000 deaths and more than 20,000 infections. The delegation did suffer losses, but not from the Ebola virus. Two members of the Cuban delegation to West Africa, Reinaldo Villafranca, a nurse serving in Sierra Leone, and Jorge Juan Guerra Rodriguez, a member of the advance team in Guinea, died during their stay in the region after contracting malaria. One of the medical team, Dr. Felix Baez Sarria, did contract Ebola while serving in Sierra Leone. After receiving treatment, Dr. Baez then returned to the country to continue to provide medical attention. Cuba has also received widespread acclaim for its “medical solidarity,” regularly sending doctors from its socialized medical system to countries throughout the world, in particular after natural disasters. The remaining 66 Cuban medical professionals still in Africa will return on April 1, 2015. Read teleSUR’s analysis of the Ebola outbreak in its series the Other Side of Ebola.